About TagAZ | ТагАЗ — новая страница в истории российского машиностроения. The Taganrog Automobile Plant (TagAZ) is a modern dynamic undertaking producing world-standard automobiles. Its equipment and production technologies correspond to the best foreign standards. 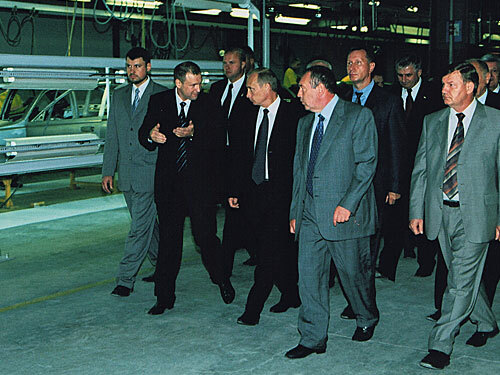 At present, total amount of investments in the construction and equipment of the plant exceeds 320 million US dollars. Since it starts in 1998, TagAZ has acquired considerable experience in production of automobiles under foreign companies’ license (Daewoo, Citroen). In 2000 TagAZ acquired Hyundai Motor Company (South Korea) as a strategic partner, who year by year gains more and more significance in the automobile society and whose products are recognized all over the world. High quality, modern technologies, wide model range and reasonable price policy have also been key factors of launching Hyundai production in Russia. First Hyundai Accent automobiles were put out from the Taganrog conveyor in May 2001. And in April 2004 the production of spacious and powerful business-classsedan Hyundai Sonata started. Because of its high quality, generous equipment and reasonable prices both models enjoy enviable popularity in Russia. Most successful experience of Accent and Sonata exploitation in Russia is also a good reason for general approval and public appreciation. TagAZ is developing successfully and takes active economic stand. In May 2005 the plant started the new line of production of a commercial light truck Hyundai Porter and the first lot of the automobiles was assembled. In April 2007 TagAZ started production of the Santa Fe Classic model, which presents the popular in Russia SUV-segment. Along with the assembly of all the models, production of components is now being organized. The near plans of TagAZ comprise further broadering of the model range and enabling of the complete production capacity. Ceremonial Opening of TagAZ, September 12th (the Day of 300th Anniversary of Taganrog). Signing of Agreement between Hyundai Motor Company and Taganrog Automobile Plant on licensed production of the Hyundai Accent in Taganrog. 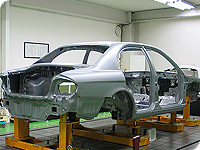 Start of SKD-production of Hyundai Accent. Start of production of Accent with automatic transmission. Change-over to the CKD-production of Hyundai Accent. Face-lift of the Hyundai Accent assembled by TagAZ. 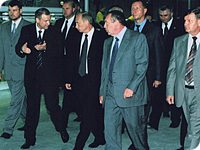 Russian President V. Putin’s visit to TagAZ as part of his trip to the Rostov Region. Start of CKD-production of the business-class sedan Hyundai Sonata. Hyundai awards TagAZ “In recognition of outstanding manufacturing performances and contributions to Hyundai Motor Company”. Face-lift of Hyundai Sonata assembled by TagAZ. TagAZ receives Award of Excellence on the Hyundai World Congress of producers and distributors in Australia. Start of CKD-production of the light truck Hyundai Porter. TagAZ produces its 50 000th Hyundai Accent. TagAZ receives Award 'The best commercial vehicle 2006 in Russia' for Hyundai Porter. TagAZ produces its 100 000th Hyundai Accent. Start of CKD-production of the SUV Hyundai Santa Fe Classic. Modern equipment and production capacity of TagAZ allow to produce simultaneously up to six different models totaling to 120 000 annually. Flexible technologies, which allows to reset equipment in the shortest terms, forms the basis of stable position in the market. 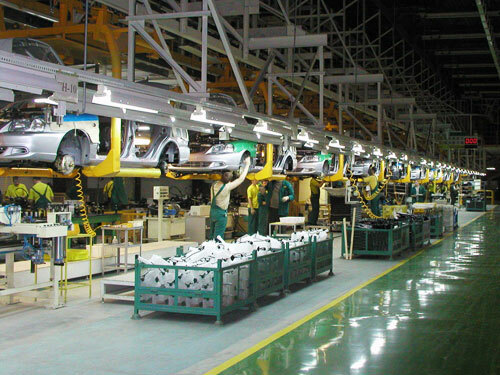 TagAZ is the full-cycle automobile plant, including parts welding and painting and further assembling. At present, the plant effects industrial assembly of passenger cars Accent and Sonata and commercial light truck Porter. The producing kits* are delivered from South Korea either directly by sea to the Taganrog port, or by railway from the Nakhodka port. 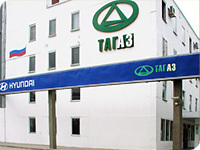 TagAZ employs a unique production scheme. It is the only automobile plant in the world where the conveyor line is placed vertically on the four floors of the main plant building. The levels are linked by the lift system. Each level is equipped by monorails and lifting and transporting mechanisms. The life of the car is started on the first level, at the semi-automatic welding line of the German company Kuka. The control of the bodies’ geometry is accomplished by 3D gauge complex by the Japanese firm Tokyo Boeki Techno-System. The control is carried out by 970 parameters. The next stage is painting. Two underground levels (about 15 metres deep) are allotted for painting. 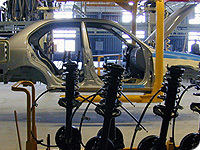 TagAZ uses painting line by the German firm Dürr — the vanguard company in the sphere of technologies of industrial painting in automobile production. According to requirements of the basic technology painting is made in six layers. 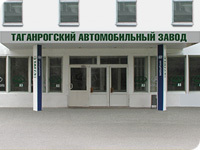 Taking into account the specify of exploitation in Russia, all the TagAZ automobiles` bodies undergo the rust-stop procedure. The main assembling conveyor is placed on the second level. 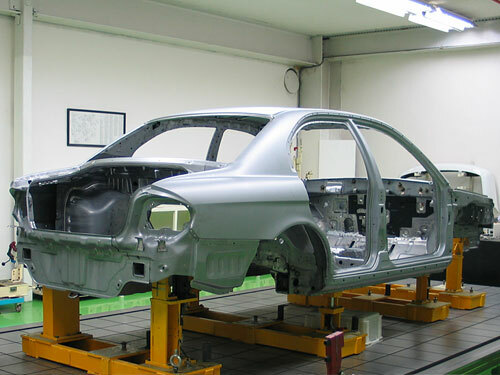 Here the painted body is filled with engine, gear, axles and other aggregates — the car receives its final look. After the assembling is finished, the car goes through the stage of diagnosis and programming of the engine electronic system. The stand of the American firm Fori Automation serves for wheel angles and headlamps alignment. The engine and brake system are checked at the American stand Burke E. Porter. The quality of the assembly is secured by 100 percent entrance inspection of details, check-up at the end of each production stage and constant quality control during the whole technological process. *The whole delivery kit of Accent totals to 843 details, Sonata — 1 117 details. 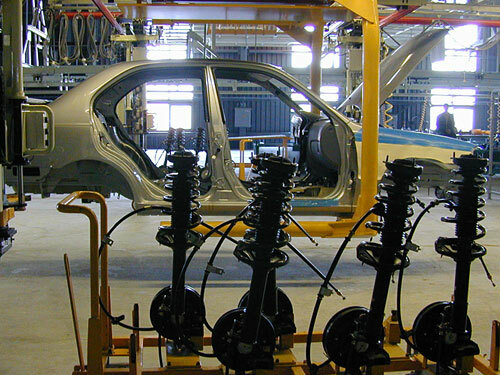 Under the plant program each car comes through 600 technological stages during the assembling. TagAZ takes pride in its skilled amicable personnel. At present employed are about 2 600 people including employees in the applied productions. 30 percent of them are engineering-technical staff. Average age of the plant personnel is 25 years. About 40 percent of the staff are women. Their patience and tidiness are irreplaceable at some stages of the assembling conveyor. At the starting period of the plant the engineer staff and young specialists were trained at automobile plants in South Korea, Europe and USA. Regular professional trainings at the leading world undertakings are part of the program of improving personnel’s skills. TagAZ collaborates with technical highest schools in employing of perspective specialists. Socially oriented staff policy and work conditions make TagAZ the one of the most attractive employers in the labour market in the southern region of the Russia. TagAZ uses the most advanced equipment and technologies of the leading automobile states — South Korea, Japane, Germany and the USA. The basis of high quality production is multi-stage control system. The automatic control is applied to the body geometry, engine parameters, brake system, wheel alignment angles and headlamps alignment. They are checked and regulated at the impartial and faultless estimation stands. The clamp of all carved junctions is effected on the conveyor by special instrument with automatic control of tightening torque. 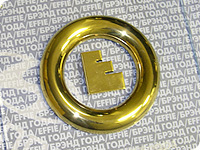 There are control posts in the end of each stage of assembling. After the conveyor all automobiles are checked for tightness (leak test) in a special shower box. After that a car undergoes a 10—12 km test drive. TagAZ disposes of a testing track with different kinds of road pavement. Every month representatives of South Korean company Hyundai hold audit of production with random test of the produced automobiles. Under the present mark system, the level of production of TagAZ out-performs all world assembly plants Hyundai and corresponds to quality of the main Korean plant in Asan. More than once TagAZ was awarded by Hyundai — “Excellence Award in recognition of outstanding manufacturing performances and contributions to Hyundai Motor Company” (2004) and “Award of Excellence” (2005). 50 per cent of Hyundai cars sold in Russia have been produced by TagAZ. And this share is growing along with the production increase. 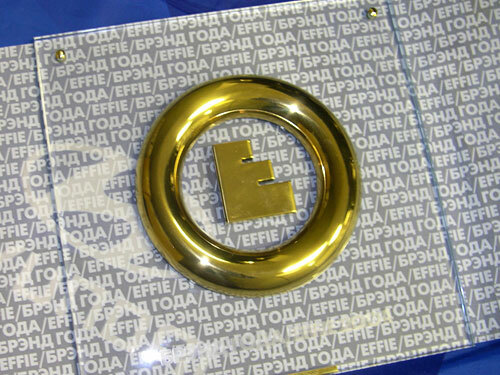 In 2004 the South Korean brand`s achievements in Russia were rewarded at the prestigious competition “Brand of the year”. TagAZ guarantee refers to the plant guarantee of Hyundai Motor Company, which makes it 3 years or 100 thousand km. TagAZ is regularly visited by representatives of government and high-standing foreign guests and is always demonstrated to them with pride. 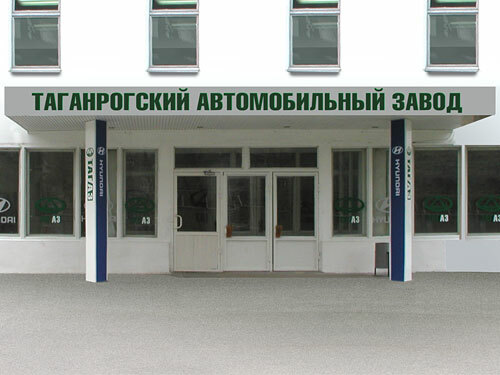 “I’ve visited almost all automobile plants in Russia, and TagAZ seems to be the best”. “Excellent production — both in its scheme and technology”.